Another day, another two tons of beef-meat riddled with brain-eating prions! The USDA has ordered a recall of over 4,000 pounds of beef because of a "remote" risk of mad cow disease contamination. Some of the beef—which is in the form of bone-in ribeye roasts—was being sold at Whole Foods. Just another reminder that expensive =/= safe. The recalled beef was packaged between September 2013 and April 2014, according to a statement from the USDA. The affected products include 40-pound cases of cryovac packages of bone-in Rain Crow Ranch Ribeye with the establishment number 2316 and quartered beef carcasses with the same establishment number. 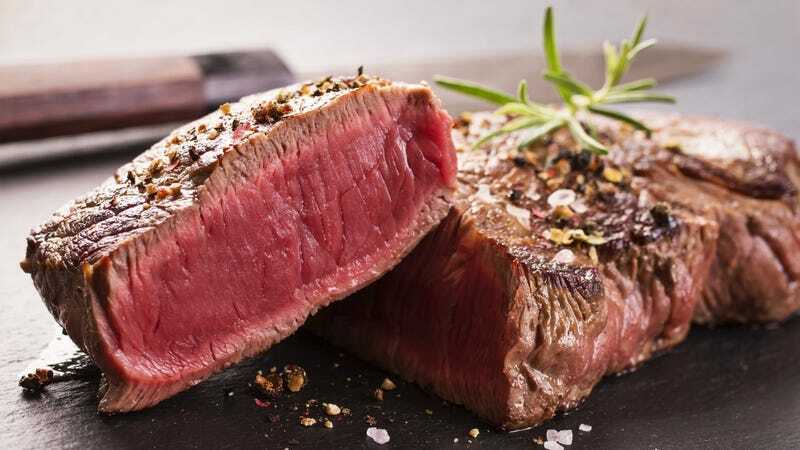 The meat was recalled after a USDA Food Safety and Inspection Service of the company slaughter logs revealed some of the cattle may not be in compliance with USDA regulations that require the full removal of the dorsal root ganglia in cattle aged 30 months and older. The problem could have been caused by the way some company employees were recording the age of the cattle. Oh, just a little dorsal root ganglia in my Sunday roast? Is that all? WHEN I WAS YOUR AGE WE ATE THREE DORSAL ROOT GANGLIAS RAW FOR BREAKFAST. BACKWARDS. IN THE SNOW. Fortunately, no one has actually gotten sick (though some researchers think that Creutzfeldt–Jakob disease might incubate in the brain for as long as 50 years before manifesting symptoms, soooooooooo...) and the USDA has classified the situation "a low-risk, class two recall." Enjoy your class two panic.